But fear-not, non-tea drinkers. There are still a lot of tasty herbal alternatives, some of which are even better than the real thing. My absolute favorite is Mighty Leaf brand, specifically Rainforest Mate. It’s a blend of matÃ©—a popular South African plant—licorice, spices, rosehips and pineapple chunks. It’s the best herbal tea money can buy. Non tea-drinkers beware, however. Although the box fails to list it, I’ve read “a hint of black tea” as the last listed ingredient on the box insert. That’s a lot better than being listed in the middle of the ingredient list, in the case of Chai, but it is something to consider. A very close second — and it really is close — is Mighty Leaf’s African Nectar. I have no idea where one finds the primary ingredient—Rooibos Leaves—but like Rainforest Mate, they make for a dark and rich herbal experience. Sweetened slightly with sugar. Goes perfect with Lorna Doones. Yum! My third favorite herbal drink used to be my favorite. I drank it enthusiastically while living in Brazil. 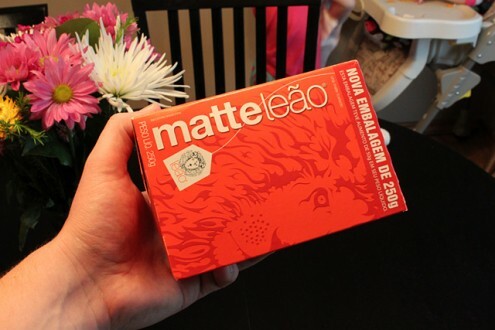 It’s called Matte Leao (pictured). The only ingredient: Mate leaves. The twist: They’re toasted, making it the darkest herbal tea I’ve encountered. It’s not as flavorful as the above two, but it may be the best “straight, no funny business” herbal tea around. Solid flavor. Sugar to taste. Of course, my wife’s new tea set—don’t look at me that way, I live in a house full of girls!—makes them all taste better. What are some of your favorite hot drinks, specifically herbal teas? Where were you able to buy Mate Leao in the states?? I’ve been dying to try it but have had no luck so far, even online. Did you get in it Brazil?